1200, September 3rd 2106, mission accomplished. 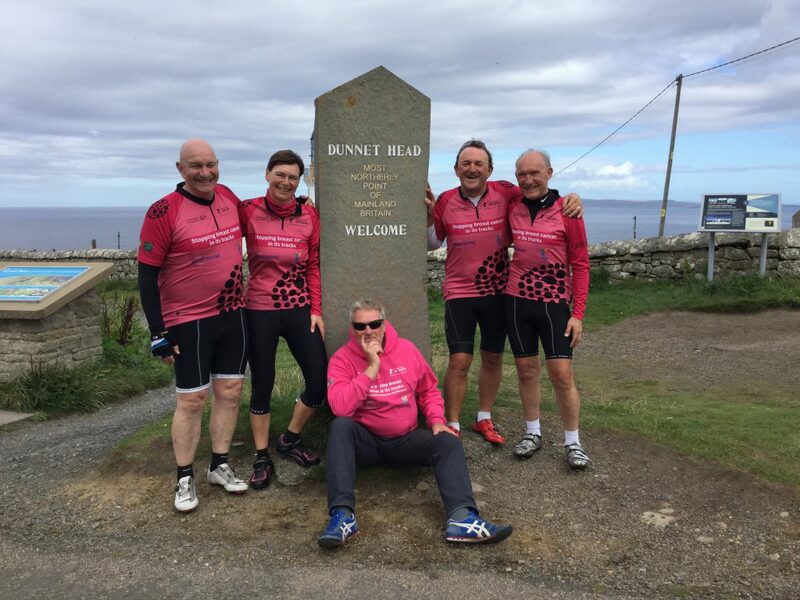 We arrived at Dunnet Head, the most northerly point of mainland Great Britain, after more than 1,300 miles in the saddle. Job done. Our day started with a splendid breakfast laid on by Fiona at the Craiglea Guest House (including a traditional, very salty Scottish porridge). I had posted my blog and was able to set off with the others. 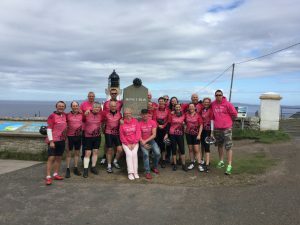 We only had 41 miles to cycle to finish this challenge, but there was an impatience to get away: partly because this was the final leg; partly because the sooner we finished at Dunnet Head, the sooner the Support Team could start the long drive back to Nottingham. It was a fast run. That had something to do with the terrain being fairly flat, it also had something to do with adrenalin; the very final stretch of a long hard haul, mentally and physically. It was overcast but bright when we left Latheronwheel. I set off with Nick and Susan. We started on the A9, then A99 to Wick. I surprised myself at how emotional I felt over that first couple of miles. I guess it was the realisation that this was not just the end of LC6, for me it was my final endurance ride. At one level odd, but at a deeper level unsurprising. This has been so much more than a series of cycle challenges. 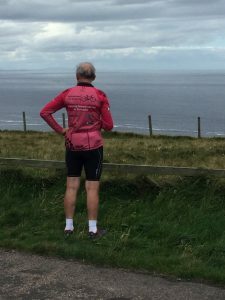 So without really thinking about it, over the 19 miles between Latheronwheel and Wick, I found myself replaying every day of every Life Cycle, all six of them: where we went, where we stayed, the bad days, the perfect days, who I rode with. It was a remarkable series of flashbacks. Once we cleared Wick, we headed north up the B876 to Castletown. 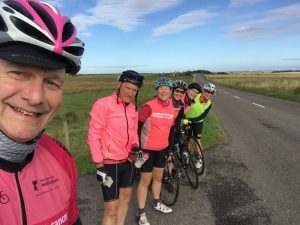 We had progressed at a real lick, and eventually stopped for a comfort break by some farm gates in the middle of nowhere, where we waved everyone else through, except Karen, Kerry and Marion who joined us for a chat. When we checked the distance we covered, it was 25 miles. Without planning to do so, we had stopped at exactly the 1,300 mile mark! We were quickly on to Castletown, then a right turn along the coast towards Dunnet Bay and Dunnet Head. By now we were blessed by skies which were cloudless and blue, and little by way of winds. The setting looked simply glorious. We stopped at Dunnet Bay for some soup, and thank you to the North Sands Hotel for opening early to allow that to happen. Then on to the final five miles. 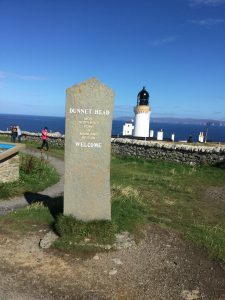 Dunnet Head is a lovely peninsula, flat at first, then a steady two mile climb to the headland and its lighthouse. After the climb, we simply rolled down towards the lighthouse. The Support Team and Susan were already there, complete with the same finishing tape we have used in all the Life Cycles. We have ended these Life Cycles at Land’s End, John O’Groats, Nottingham and Dover. None comes close to Dunnet Head. It is a truly incomparable setting; a dramatic headland with a 360 degree panorama across a vivid blue sea to the Orkneys, across the headlands towards John O’Groats, and back over the Dunnet peninsula to Dunnet Bay. What a place for it all to come to an end. There was, understandably, an awful lot of emotion: a mixture of relief, exhilaration, pride, and just plain satisfaction. We had champagne to celebrate, took our pictures, repacked the vans, and the moment was gone. But what a moment to cherish, and the moment is held for us in the images we have, including one of the four riders and one Support Team member who have completed all six Life Cycles (Karen, Nick, Stefano, Paul and me). The big van with Gary and Ian set off direct to Nottingham with our bikes and boxes; the minivan took us to Inverness Airport for a flight back to Birmingham. The trip from Dunnet to Inverness was a very jolly, at times raucous one, but great fun. It even included a comfort break at Glenmorangie Distillery. So I finally got a (very brief) visit in, but one long enough to treat myself to an 18 year old special edition. This was a really exacting ride, for me at least probably the toughest (and I am happy I have come through it with my new hip intact!). Overwhelmingly, most people who have taken an interest in this Life Cycle understand what the riders go through, mentally and physically. Indeed the mental endurance associated with total concentration for eight or nine hours on the road day after day is just as exhausting as the physical endurance. Karen, Kerry, Marion, Susan, Kate, Sara, Nick, Doug, John, Andy, Stefano, Steve, Paul, Gary, Ian and Louise / Gavin / Simon; I have nothing but respect and admiration for you all. I am proud to have done this with you. My thanks to the riders for the time you all put in to preparing for this, including family time given up at weekends over a long period; and my thanks to our families for their support in general, and a willingness to put their lives on hold for the last 16 days (including births, birthdays and anniversaries missed). To the Support Team, you have looked after us and our bikes wonderfully well, with consummate professionalism, humour and creativity. We are all proud of you. 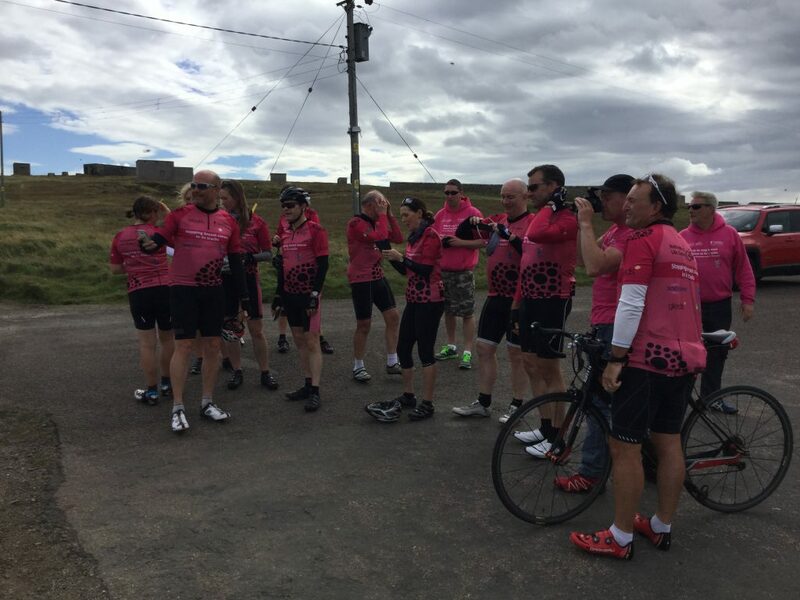 Thank you also to the route planners, Gavin in particular, who did a splendid job, and the logistics team led by Clare Anderton, which made all of our bookings. Thank you to Lisa and Toni in my office , and Tom and Victoria in CARO who ensured the daily blog was posted. But in all the emotion of completing this challenge, let’s not forget why we did it, and the work we still have to do. Our Life Cycle miles on our final day were ridden in honour of Leanne Cann (nominated by Emma Oldham); Val Senior (nominated by Theresa Devaney); Sarah Carter (nominated by Kate Radford); David Talbot (nominated by Cheri Ambrose) and Rachel (nominated by Julie Miles). You, and all of the others who agreed to have your stories told have personalised this for us in a very meaningful way. Total funds raised are almost £543,000 and other upcoming events, including tomorrow’s Community Day on University Park will continue to grow that. And what of the Decomnium / Megomnium. Well, that was just an illusion. It served an important purpose in binding in new riders, reconnecting old riders, and just offering a distraction in those early days when there were 90 to 100 miles to do day after day. There is no final leader board. Everyone’s a winner. We have the LC6 Community Day to look forward to tomorrow, with over 600 cyclists involved in distances from 10 mile to 75 miles. Then the bubble will burst, and we will be back to our normal lives. But things are never quite the same again, in a good way. So, That’s it. Life Cycle 6 is over, and for me these endurance rides are over. Thank you all. It has been a genuine privilege. Congratulations – what an amazing feat. I’m in awe of you all and I hope you enjoy a wonderful homecoming and a very welcome rest! Just fantatsic! There aren’t really words to do justice to everything that you have all accomplished – you are an example to us all. It is a privilege to have followed this year’s endeavour, courtesy of this entertaining, inspiring and informative blog. As you celebrate your truly awesome achievement, I salute you and wish you as much rest, recovery and self-indulgence as your busy schedules allow. Outstanding!! A wonderful team and ( someone has to say it) a wonderful and inspirational leader. It was a privilege to do Lochs and Glens and a day of the long challenge with you all. I’ve done a few tough physical challenges in my life but no-one should underestimate the scale of what you all ahieved. Incredible. Good luck, David. I wish you success. Brilliant effort everyone, well done! Congratulations to the whole team and a huge thank you for inspiring so many of us everyday along the journey! Together we really can make a difference. Brilliant achievement. As someone whose major goal this week was being able to climb the stairs (on crutches I should hasten to add) I salute you! Seriously though, the entire lifecycle project has been such an amazing thing, and well done to all who have taken part down the years. Now rest …. Many congratulations to David and the whole team on such an outstanding achievement! very well done! I’m proud of you! Almost bonfire night and I am only just catching up with all of this fantastic blog and what a story to tell! The six rides are an astonishing achievement and so much money raised for such good causes, well done to everyone involved and congratulations to Nottingham, the university and the city, a brilliant initiative.